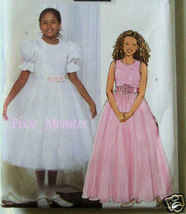 Butterick Lauren Scott Pattern 4441 Girl's Sizes 7-8-10 GIRLS DRESS: Fitted, lined, flared dress, above ankle or evening length, has contrast overskirt, back zipper, attached petticoat and purchased trim. A: above elbow sleeve with elastic and self ruffle. B: contrast bodice with neck or armhole bindings. Sizes: 7-8-10 Brand new uncut pattern dated 2005. From a smoke free home.